The Beacon Hill Scholars is a diverse group of individuals who seek to research, interpret, and preserve the history associated with Beacon Hill, and particularly the community of free african americans that thrived here in the 19th Century. This organization originated as a discussion group centered around a reading of James and Lois Horton's Black Bostonians. The group was meeting in the Abiel Smith School on Beacon Hill where, in the 19th century, the pupils were not referred to as students, but as scholars - from which we adopted the name, Beacon Hill "Scholars". We share an interest in drawing connections between events in our past, and what is going on at the present. We find inspiration in the examples of many courageous individuals who came before us, on whose shoulders we are standing today. Together we hope to continue building upon their mission – To foster justice, equality, and social and economic responsibility. You can contact us at beaconhillscholars@gmail.com. Click here for more information about BHS founder Horace Seldon. Retracing the path of women abolitionists in Boston, October 21, 2013. On that occasion, a racially integrated group of women abolitionists held the first annual meeting of the Boston Female Anti-Slavery Society. This meeting was originally to have taken place a week earlier. 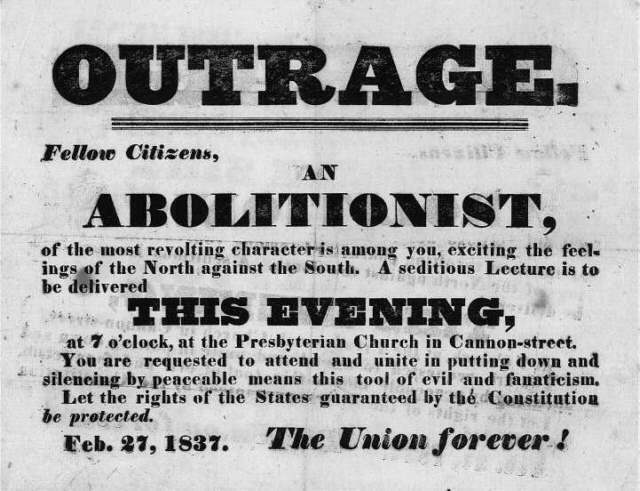 But the public announcement, that this organization had invited the charismatic british abolitionist George Thompson to speak at their meeting, was met with a campaign of intimidation waged in the newspapers and handbills. Fearful of property damage, and of the cost of protecting an international celebrity-activist with a bounty placed on his head by ideological opponents, the usual venues for public meetings this time closed their doors to the society. These women were forced to reschedule their meeting for October 21, with William Lloyd Garrison as their guest, at their own offices at 46 Washington Street. Pro-slavery interests had recruited ruffians to disrupt this meeting. That afternoon a violent mob surrounded and broke into the building. Only 25 or so of the Society's members had made it inside. Under pressure from mayor Theodore Lyman to leave, they were forced to adjourn. Exiting the building, and augmented by those of their membership who had been prevented from entering, these brave women marched arm in arm together, black and white, with grace and dignity through a angry and dangerous mob. They proceeded down Washington Street to Maria Weston Chapman's home on West Street, where they completed their business. It was also on this occasion that William Lloyd Garrison, trapped in the same building, narrowly escaped a lynching by the same mob. At left: October, 2005. The tragic destruction of John P. Coburn's "hidden" house at 3 Coburn Court, thought to have been a refuge on the Underground Railroad. The earlier of Coburn's two houses on Beacon Hill, this small 2&1/2-story building had stood here at the end of this narrow passageway since the early 1820s. Due to a technicality in the statutes for the Beacon Hill Historic District, this building was not protected from demolition by a developer who wished to build a larger, more profitable building on this site. Unfortunately, this historic district only protects architectural features that are visible from a "public way" i.e. the street; Yet at the same time, structures that like this one happen to be located within its boundaries are disqualified from other means of historic protection. That 3 Coburn Court was so well hidden is also why it was prized by local historians who had just identified it in 2002 - as a likely safehouse. This house had ready access to passageways that leading in multiple directions from both front and rear of the house -- And a tiny "lookout" window in the basement, hidden in plain sight under the front entryway. (Visible in the photo at left, Just underneath the green door). Set into the steeply sloping hill, this house's basement is at ground level in front, and its first story is at ground level in back. Standing behind that hidden window, one had a clear line of sight down the passageway to Southac [Phillips] street; And immediately behind were stairs leading upstairs to the rear of the house where one could step out into the rear passageways. John P. Coburn, African American clothing dealer, was prominent in local fugitive slave assistance organizations such as the New England Freedom Association, which he helped found. He also was one of the founders of the Massasoit Guards. Coburn's second house [not pictured] is better known. A grander building c 1845, that building was designed by Asher Benjamin and stands prominently at the corner of Irving and Phillips Streets. Under IRS section 501 (c) (3), The Beacon Hill Scholars, Inc. is qualified to receive tax-deductible bequests, devises, transfers or gifts. If you would like to make a tax-deductible contribution, please make checks out to the Beacon Hill Scholars and send to Beacon Hill Scholars, P.O. Box 5686, Boston, MA 02114. Please make note if your donation is for Abolition Acre.